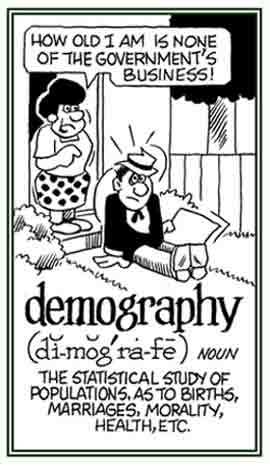 Relating to demography or demographics. The characteristics of a human population or part of it; especially its size, growth, density, distribution, and statistics regarding birth, marriage, disease, and death (requires a plural verb). The study of human populations, including their size, growth, density, and distribution; as well as, statistics regarding births, marriages, diseases, and deaths: In her sociology class at college, Susan became very interested in the demography in her area and decided to learn more about the residents in her community. © ALL rights are reserved. 1. A tree-like figure used to graphically represent a hierarchy. 2. In biology, a branching diagram used to show relationships between members of a group. 3. A family tree with the oldest common ancestor at the base, and branches for various divisions of lineage. 4. An instrument used to measure the periodical variations in the size of tree trunks. A written description of a tooth or teeth. An instrument for marking the skin. The marking of the skin which is seen after rubbing the skin firmly with a blunted point. A condition in which the skin is peculiarly susceptible to signs of irritation; such as, with red coloring. A description of the skin. A condition in which the skin is peculiarly susceptible to irritation. A reference to the condition in which the skin is peculiarly susceptible to irritation. A written description of the skin. Showing page 23 out of 92 pages of 1378 main-word entries or main-word-entry groups.